Welcome back to our Power Pivot blog. Today, we discuss how to create conditional custom columns with multiple criteria… again. Today we discuss the different methods to create conditional custom columns in Power Pivot, this time using the OR function and the ‘||’ operator. We have a Table with three categories and a column with customer names. We are going to assume that this Table has been retrieved by Power Query (otherwise known as Get & Transform) and loaded into our data model in Power Pivot. For the purposes of this exercise, let’s assume that we wish to create a conditional column that will return with the value “Included” if a customer is “Y” in Category 1 or “N” in Category 2. 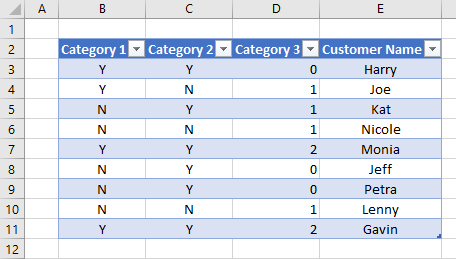 What if we want a conditional column with three conditions? That’s all well and good, but what if we have four or five criteria? We do have an alternative we can use the ‘||’ operator. The ‘||’ operator allows us to combine several criteria into one logical test for the IF formula drastically simplifying the formula. That being said, the ‘||’ operator is a great way to avoid creating nasty nested IF formulae when creating our custom columns in Power Pivot. That’s it for this week, tune in next week for more Power Pivot, until then happy pivoting! Stay tuned for our next post on Power Pivot in the Blog section. In the meantime, please remember we have training in Power Pivot which you can find out more about here. If you wish to catch up on past articles in the meantime, you can find all of our Past Power Pivot blogs here.